Heat the heavy cream over medium heat until it starts to get bubbles along the edges. Whisk together the egg yolks, granulated sugar and apple butter. Slowly pour about 1/4 of the cream into the egg mixture while whisking constantly. Then, slowly pour in the rest of the cream while whisking constantly, until combined. Strain the custard through a fine mesh sieve, a strainer or cheesecloth. Place 4-6 ramekins into a roasting pan and divide the custard into the ramekins. Carefully pour enough hot water into the roasting pan until it comes halfway up the sides of the ramekins. Bake at 325 degrees for 40-45 minutes, until the creme brûlée is set but still trembles in the center. Place the creme brûlée in the fridge to cool for 2 hours (or up to 3 days, covered). 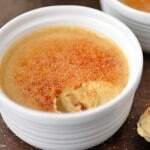 Before serving, remove from the fridge and sprinkle each creme brûlée with 1 teaspoon of granulated sugar. Caramelize the sugar with a kitchen torch slowly moving it back and forth about 3-4 inches above the sugar. *Note: If you do not have a kitchen torch, caramelize the sugar under the broiler for 2-3 minutes, watching carefully so that it doesn’t burn!